Make it easy by going naked with your cake and using a box. Replace the oil with melted butter (salted or unsalted). Add an extra egg to the amount specified in the box recipe. Replace the water in the recipe for whole milk or buttermilk. Add 1 tablespoon of instant espresso to the batter. Add 1 teaspoon of vanilla extract. 2. Divide the batter between 3 (6-inch) cake pans (buttered and lined with parchment). Bake according to the box recipe instructions. Beat the butter at medium speed in the bowl of an electric mixer until creamy. Gradually add the sugar, alternating with the milk and whiskey, beating at low speed just until incorporated before the next addition. Mix in the vanilla bean paste and salt. 1. Combine 1/2 cup sugar and 1/2 cup water in a medium saucepan over medium heat, stirring until sugar is dissolved, 2 to 3 minutes. Add the cranberries and stir until well coated. Using a slotted spoon, transfer to wire rack; let dry for at least 1 hour. 2. Working in batches, roll the cranberries in the remaining 1 1/2 cups sugar until well coated; let dry for at least 1 hour. 1. 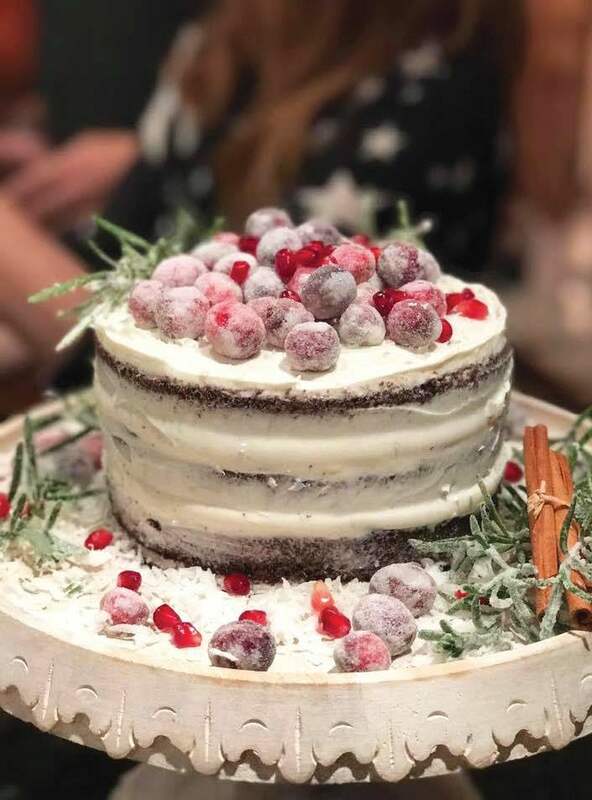 Place a dollop of frosting in the center of a cake stand or serving plate (to keep the cake from sliding) and place 1 cake layer on top of frosting. Spoon frosting directly on top of first layer; using an offset spatula, spread the frosting evenly over the top and just past the edges of the first layer. Place the second cake layer upside-down directly on top of the first layer; repeat frosting process. Place the third cake layer on top of the second layer. Spoon more frosting directly on top of third layer, and lightly frost the entire cake, starting with the top and moving down the sides, leaving the layers largely exposed. 2. Place the assembled cake in the refrigerator for 20 minutes to allow the icing to set. Before serving, decorate with the candied cranberries and pomegranate arils.